Ever had the feeling of being watched – that uncomfortable sense which presses you hard against a wall, eating your mind inside out, and leaving you vulnerable and at god’s mercy? Often so, it is a game played by our mind. But there comes a moment when you see those eyes, staring right at you. And that’s when you feel it – the fear of being hunted. Eyes are meant for seeing. Yet there is more than meets the eye. Eyes speak, eyes express, and eyes display sheer joy or utter sadness. Eyes are an identity of a person, a community or of an entirely different species. Eyes are what I am going to talk about today. With a myriad of hues, from green to blue and brown to black, humans have one of the most beautiful eyes on this planet. But there are some that are beyond imagination, far better from our vision and beyond our understanding. These eyes belong to those primitive arthropods, the magnificent birds and reptiles, amphibians and mammals, and other creatures of the seas. The evolution of eyes is one subject that deserves a book. So instead, let’s see the sort of eyes we commonly come across on forest paths, at night, or as a sheer surprise. Such eyes are highly evolved, sometimes most serene or just stunningly haunting. 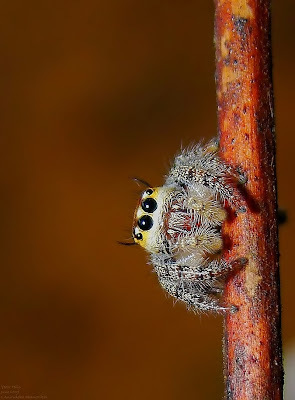 Ocelii of a Jumping Spider (Family Salticidae). which aides in its identification upto Family level. 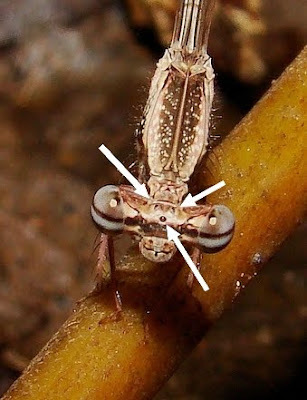 The simple eye, or Ocelli, is the primitive one and persists today only in arthropods. It literally means a “small” eye! They are best seen in Spiders, in arrangements of either six or eight. 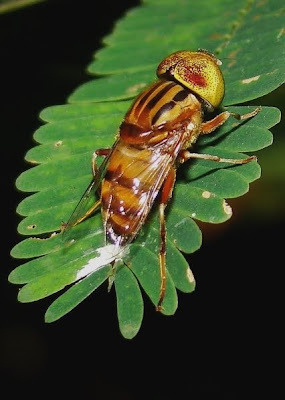 In insects, they are generally placed high on head and function as light-sensitive-organs in the sense they do not form a clear image what-so-ever. The compound eye, Ommatidium, is a hundred or a million tiny lenses – photoreceptor cells, cemented together by pigment cells, and each tiny lens acts as an individual eye – capturing the picture and passing the message over to brain. 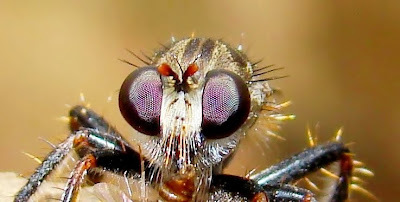 These eyes are best seen in insects, where they form a major portion of the head. For instance, in dragonflies – the ommatidium are so large that they cover two third of the head! These give the insects not only a “light sensing” organ, but a picture of what’s around. However, much of the vision is in the UV spectrum of the light. Hence, most insects don’t see the colors as we see. 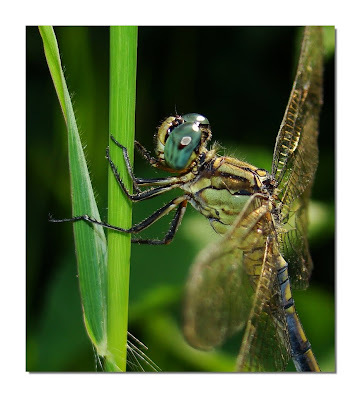 The eyes of the insect world are much complex and large in proportion to their body size. This, along with sensitive hair, alert antennae and a sense of smell – has made them one of the successful animals living today – far successful than where humans stand in the line of evolution. As we come to higher organisms, we see the eyes much similar to that of humans. 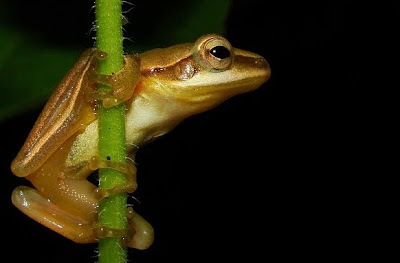 These can rightly be called complex eyes, for they can detect colors extremely well, can see in the distance, and are capable of following fast actions. Such eyes further evolved and made some animals to see in pitch dark. By adjusting the amount of light entering the retina, the pupil can be positioned with respect to the intensity of the light. 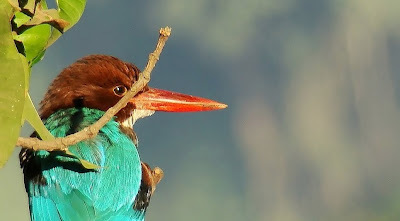 Thus, we have eyes with a round pupil as in humans, a vertical pupil as in cats and reptiles and other nocturnal creatures, a horizontal pupil in some and large, bulging eyes that are hard to forget like that of an owl. These nocturnal creatures, bounce the light back if flashed by a light source such as headlights, torch or a camera flash. This is an adaptation where the reflected light is again reflected back onto the retina – thus giving the animal a supreme night vision as compared to that of humans. 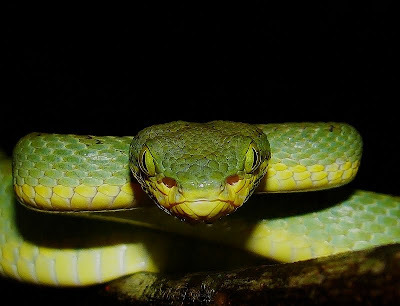 Vertical eyeslit of a Bamboo Pit Viper gives it a sinister look! 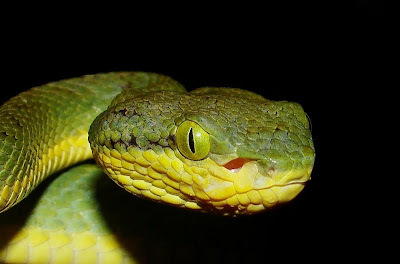 The most striking eyes I have ever seen are that of a Bamboo Pit Viper, those large, green eyes with a vertical pupil, giving a sinister look to the snake. These eyes are that of a nocturnal animal and that’s what the Pit Viper is. 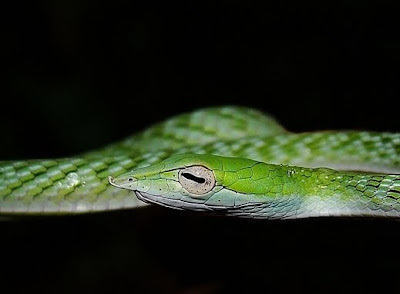 And horizontal pupils that of the Vine Snake, which gives them such an elegant look, so beautiful and seemingly fragile. Geckos have cryptic eyes and one of the most beautiful in my opinion. All these eyes speak for their owner. And one look from them is enough to either scare you or put you in a trance. So, keeping this in mind, some animals evolved further to recreate eyes, but only this time, those eyes could not see. Such are the false eyes, which are a part of mimicry – the game of life and death. These eyes can be seen on insects in common, such as in Lepidoptera. 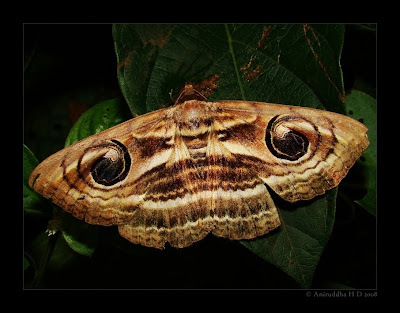 Some moths display big, bright eyes on their wings – such as the Owl Moth – and are a treat to watch really, but are so original that they do keep predators at bay. It is a common occurrence in butterflies, some mantids, and even higher animals such as fishes and snakes. This is a clear instance where eyes speak louder than words! On a last note, let us not forget the vivid colors of nature that please our eyes, the sight of birds and butterflies, or a tiny flower on a wasteland. If there was no organ such as eyes, there would be no beauty around, and if there was no beauty in nature, we wouldn’t have eyes. Eyes are more than just to look out for danger, or look for food. Our eyes have come a long way, from being the simplest light-detecting-device to designing a false eye. Some evolved excellent eyesight, while some gave up eyes completely. It is the vision that comes first if we want to understand something in its full form and structure, and is a nature’s gift we all must be grateful for. If you want the blind to see, to share the world of colors, do plan to donate them once your days are done.